It was a family day out for the Afflecks on Sunday. 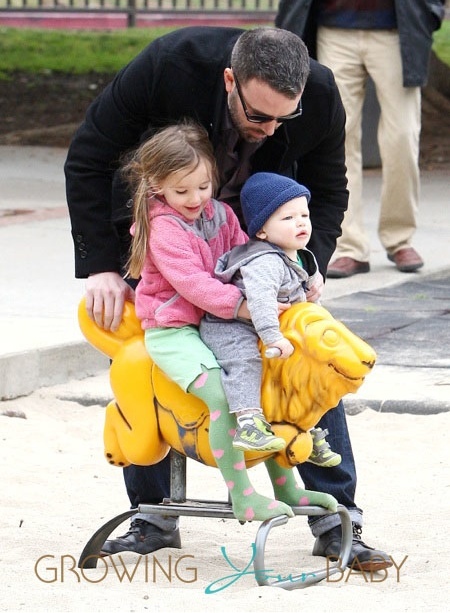 Cute couple Ben and Jen were photographed enjoying some time at the park with their three kids, Violet, Seraphina and Samuel. It was all hands on deck for the pair who took turns playing in the sand with their littles. One of the cutest moments from the day out was when Ben placed Sera and Sam on the rocking Lion together. She is such a sweet big sister and made sure she held him tight so he didn’t fall off. Now a year old, it also looks like the little guy is close to walking. After months of filming and promoting, Ben now has some time off between projects. Hopefully this means that we get to see lots of family time together.